This past week I finished up the binding and hand quilting on my king size quilt. I was hoping to be able to take photos outside but I need helpers, dry weather, and good light all at the same time to make that happen, and that might not be possible for a while. So for now, here are photos of it inside. I had to look at photos of the finished quilt top to remember which way I had decided was the top. The quilt consists of 16 improvised log cabin blocks that are near 16" square. I used flea market fancy fabrics and other fabrics that coordinated with the FMF. The fabric used for the sashing and borders is Moda crossweave. 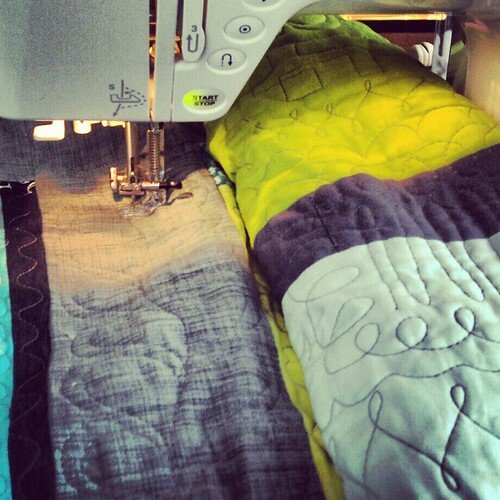 I machine quilted the quilt on my Janome QC 4900. 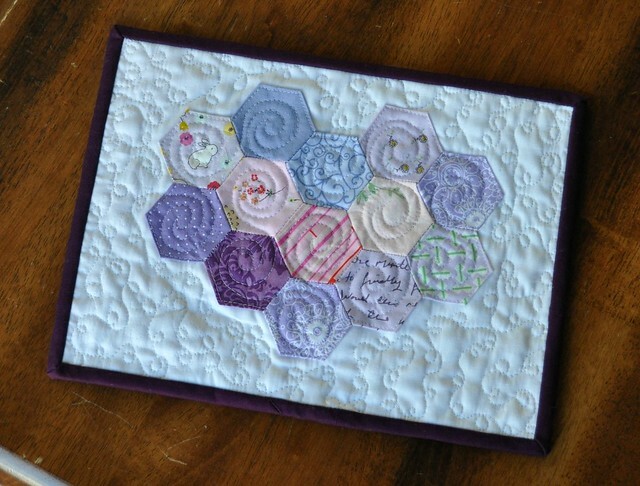 There are a few pops of hand quilting too. 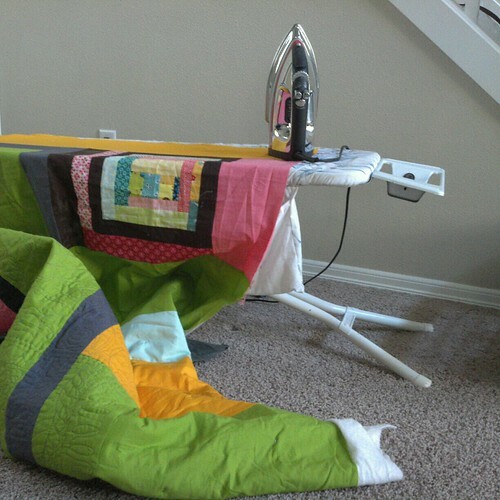 The main trick for machine quilting this quilt (around 96" x 104") is to not put all the batting in at first. *For my first chunk of quilting on this quilt, I pin basted a piece of batting that was as wide as the two center rows of blocks, plus about 4 inches on each side. 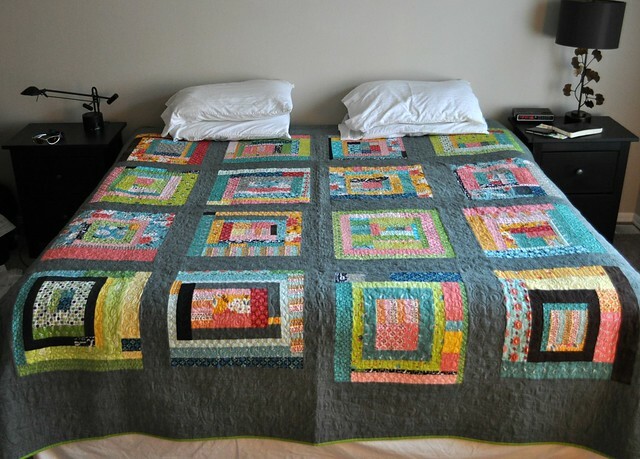 Depending on the design of the quilt, it would be good to try to divide the quilt into thirds and put the middle 1/3 of batting in to begin with. *Then I machine quilted that section, leaving the 4 inches on each side, and the borders, unquilted. 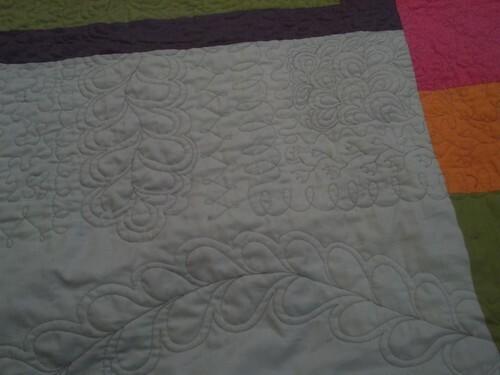 *Next I attached batting to one of the sides, pin basted the batting in, and quilted it. (But not the borders.) This tutorial of mine shows how my grandma taught me to piece batting and that's how I attached the batting during this process. 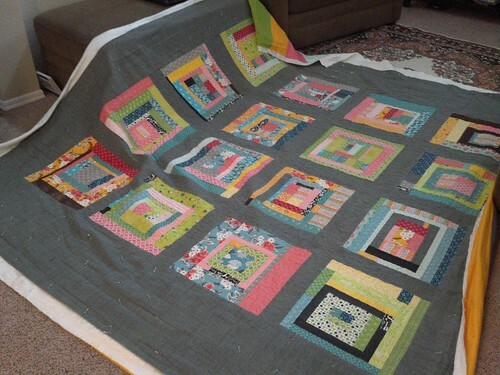 *Then I attached the batting to the other side and quilted the blocks and sashing on the other side. 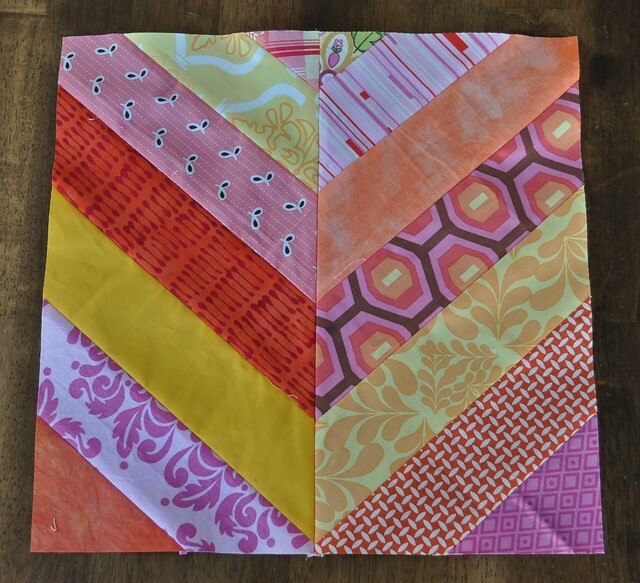 *The final step was quilting the whole border, which wasn't really difficult at all because I didn't have much quilt to the right of my sewing machine needle. 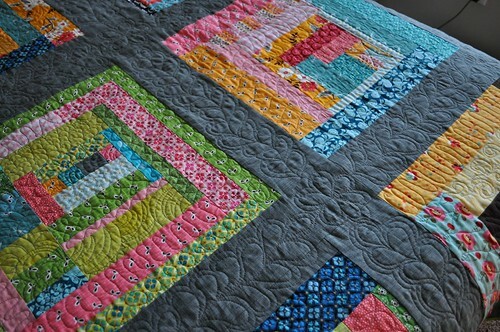 I quilted feathers with echo stitching in the sashing and borders. 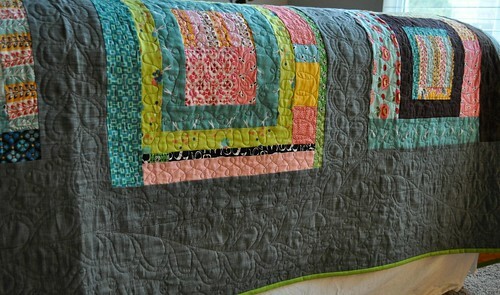 In the borders, the space around the feathers is quilted with small loopy quilting. I thought about doing something fancier, but decided to make it easy on myself at that point. I like the pink/blue/gray color scheme of this block. 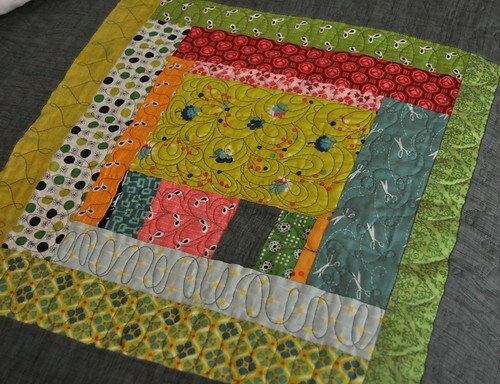 I quilted this block after I learned to do the clamshell/paisley quilting design. The feathers and the flowers I put in the feather intersections show up pretty well here. 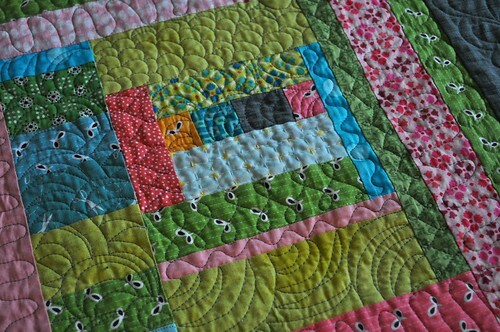 This one has a lot of texture, plus it shows one of the little hand quilted spots in the quilt. Mostly kona solid fabrics, with a couple of extra blocks. We can reverse it if we get tired of the front, I suppose. I'm really happy to have this project completed and on my bed! I'm not sure I'll make another quilt this big for quite a while, but I'm glad I made this one and I feel like I learned a lot along the way. The last couple weeks I've been pushing hard to finish up my king size quilt. 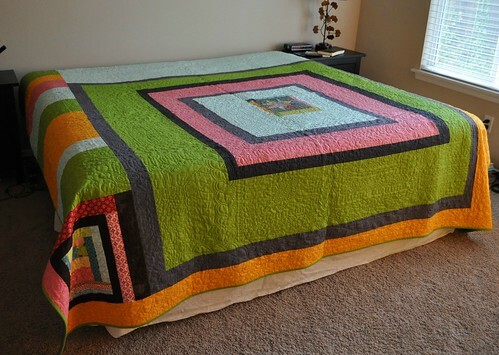 I made the quilt top in the spring of 2011 as part of a Naked Bed Challenge on twitter. 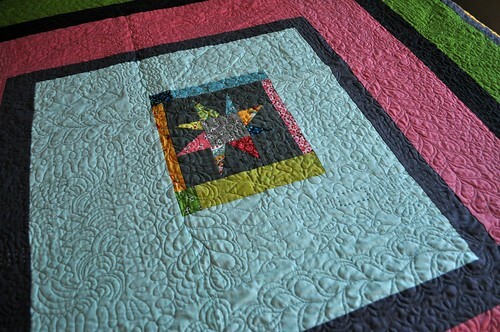 I got the quilt backing made soon after we moved into the house here in Washington, at the end of 2012. 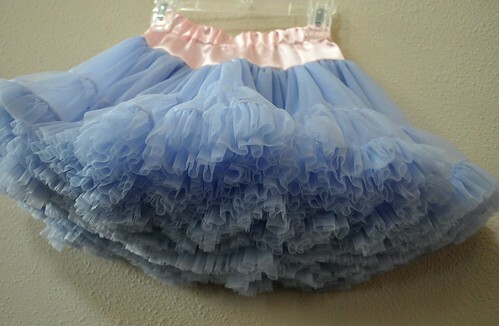 (I don't think I've taken a picture of the back yet, though.) I started the machine quilting at that time too, but lost steam on it and put it away for a while. Then, I was getting all gung ho and ready to finish it up around the end of June, right before I hurt my finger and had to take an extended break from sewing. Quilting a feather in the sashing. Ironing the quilt back to prepare for adding in the last section of batting. 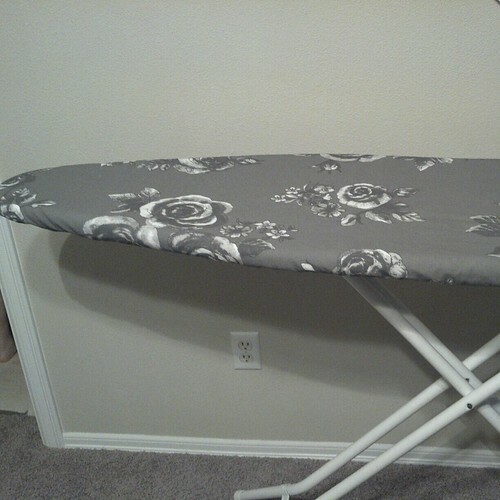 I lowered my ironing board to about 18" tall to do this. It was silly. I'll explain how I did the batting more completely when I blog about the finished quilt. The border fabric on the front and thread are both gray and the quilting doesn't show up well, especially in the evening after the sun has gone down. So I flipped over the border for this picture, and then had a dancing girl who wanted to be in the photo too. 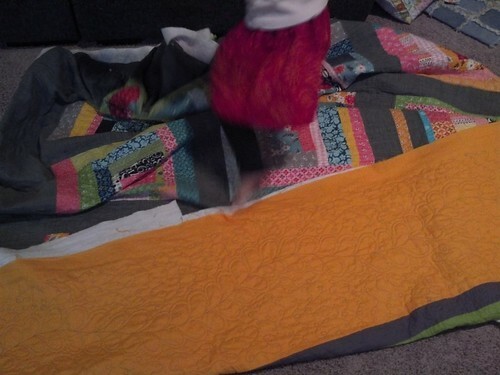 If you look closely, you can see the loopy quilting I'm doing as filler around the big border feather. I have all the border feathers finished, and just need to finish adding in loopy filler quilting on two more sides of the quilt, and then the machine quilting will be done. There are a few more sections of hand quilting to do, then binding and labeling, and then it will be completed! I've been busy sewing the last couple weeks. This is going to be sent to the Alzheimer's Art Quilt Initiative. 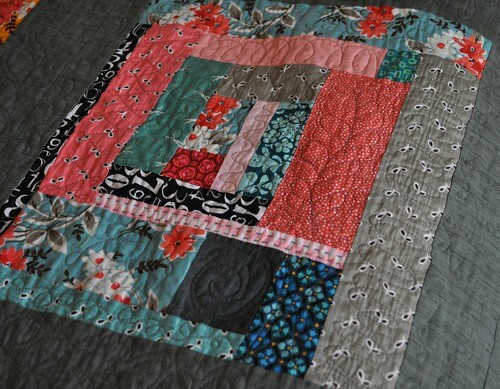 I'm planning to make a couple more quilts for them in the next few weeks and then send them all in together. 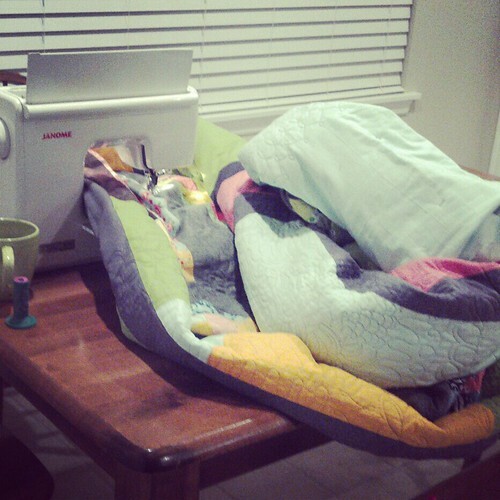 If you haven't made a quilt for AAQI yet, think about it. They sell/auction mini quilts to raise awareness and to fund Alzheimer's research, and they accept quilts no larger than 9" x 12" so it's not really a big commitment to make a quilt and help them out. I already finished my do good stitches blocks for January. Crazy, huh? 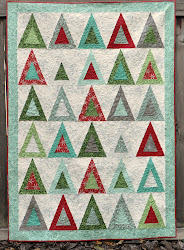 These chevron blocks were made using the herringbone block tutorial from Bijou Lovely. 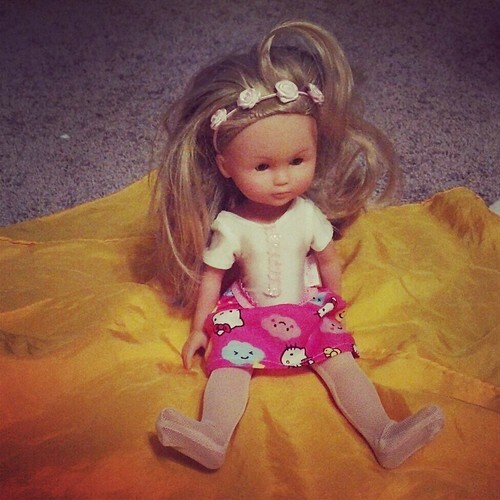 My little girl helped me make this skirt for her doll, Molly. (She pushed the foot pedal on the sewing machine.) 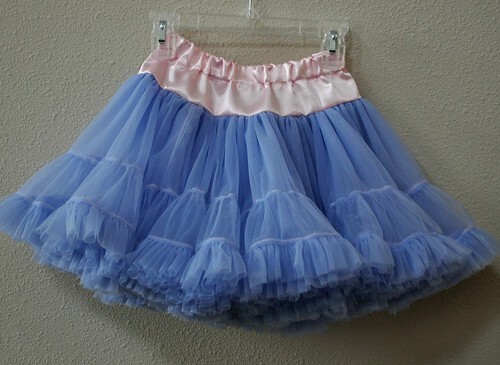 I have "1 or 2 doll clothes items" on my January to-sew list and this was fun and quick to make. And we had been needing a new ironing board cover for a while. I got the fabric at Ikea a couple weeks ago. I used an old towel (trimmed and edges zigzagged) and one layer of cotton batting (scraps I sewed to fit the ironing board) for the padding. 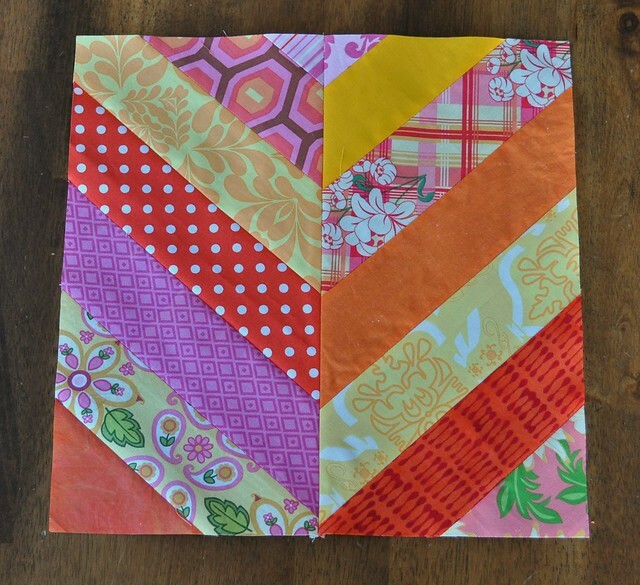 I looked at this tutorial on Moda Bake Shop and decided to follow the method described there for finishing the edge and making a casing (even though I didn't make a quilted top like they did there). I just used kitchen string to adjust the cover to fit; it worked great!